While browsing NetGalley, I saw Cindy Williams's upcoming memoir available and the email acceptance to read it thrilled me. I read Penny Marshall's My Mother Was Nuts a few years ago, and hoped to read another side of the story. Shirley is much shorter in length, and of course covers other highlights in Cindy's career. She's an enthusiastic storyteller who, much like her TV counterpart, keeps everything upbeat. What I Liked: Williams's story of her early career highlights a truth applicable anywhere in entertainment: you can hit the ground running with a smash movie but it doesn't guarantee eternal success. To read about going from roles in three Oscar-caliber films to no work at all got my sympathy, especially as she considered quitting the biz altogether before the Happy Days spinoff came along. 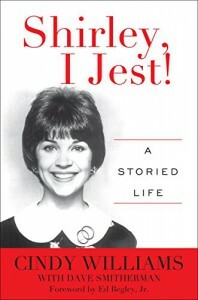 I liked the anecdotes about waitressing at Whiskey a Go-Go, and her exploits with Andy Kaufman, too. I had seen Williams on his TV special but didn't know they shared a deeper friendship beyond that. I would like to have read more about that, whether the relationship lasted until his death. The mention of her firing takes up a page at best, and you don't learn anything new about that or any tension between her and Penny Marshall, or her involvement in subsequent reunions. I always thought Williams got a raw deal, as though being punished for wanting a family. How difficult is it to shoot closeups or position a pregnant actress at a desk or behind a counter? Granted, L&S relied on physical comedy, but they also embraced change. It could have ended better. If you invest in this book for L&S memories you'll find some interesting off-screen gems, but you may want to read Penny's book in tandem.